While North Melbourne defender, Daniel Pratt, might be regarded as being one of the toughest players in the AFL, he shows that there is indeed a softer side of him when it comes to dogs. 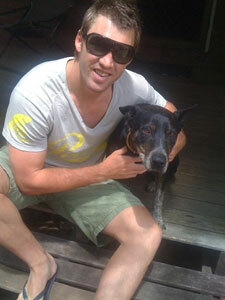 Growing up with pets around the house, Daniel continues the tradition when he acquired Rocky, a Kelpie cross. Even at 8 years old, Rocky enjoys being active. “Rocky would dog paddle in the ocean for hours on end,” an amused Daniel said. However, it was not all fun and games when one day, energetic Rocky ran away with another dog. Daniel who loves his best mate was understandably distressed. Fortunately because Rocky was microchipped, Daniel was able to locate the cheeky pair at a local nursery, thanks to the National Pet Register. With the onset of summer, Daniel can look forward now to many more days on the beach with ‘Rocky’, with an added sense of security that should a wanderlust get the better of ‘Rocky’ again, he is guaranteed to be reunited with his friend through his microchip and collar tag. The National Pet Register reunites over 500 dogs and cats with their owners every week. To make sure that your pet always has a return ticket home should they become lost, they recommend that every pet be microchipped and wear a collar tag. To receive your free tag register at petregister.com.au.